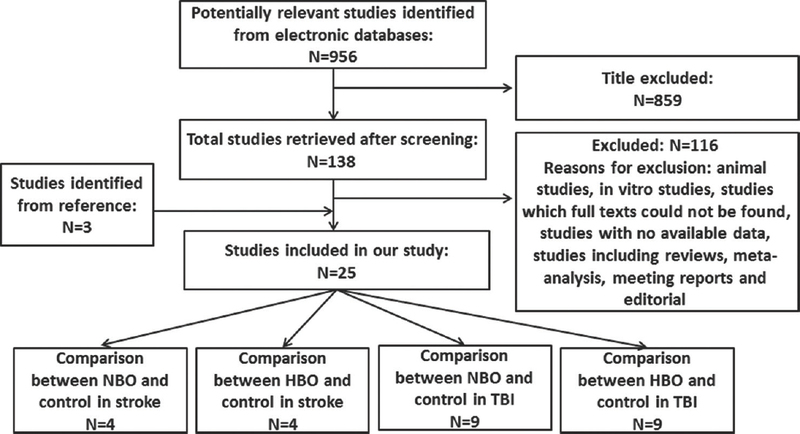 This study reviews the oxygen therapy (normobaric oxygen [NBO] and hyperbaric oxygen [HBO]) in both stroke and traumatic brain injury (TBI) patients and meta-analyzes the efficacy of two oxygen therapies in different kinds of injuries. In stroke patients, NBO showed significant improvement in reperfusion rate while there is no favorable outcome effect of HBO treatment. In patients with TBI, HBO showed significant improvement of Glasgow outcome scale score and reduction of overall mortality while NBO may play a favorable role in improving brain metabolism. Introduction: The purpose of this study was to evaluate the fracture resistance of monolithic computer-aided design/computer-aided manufacturing (CAD/CAM) crowns that are prepared with different cement thickness. 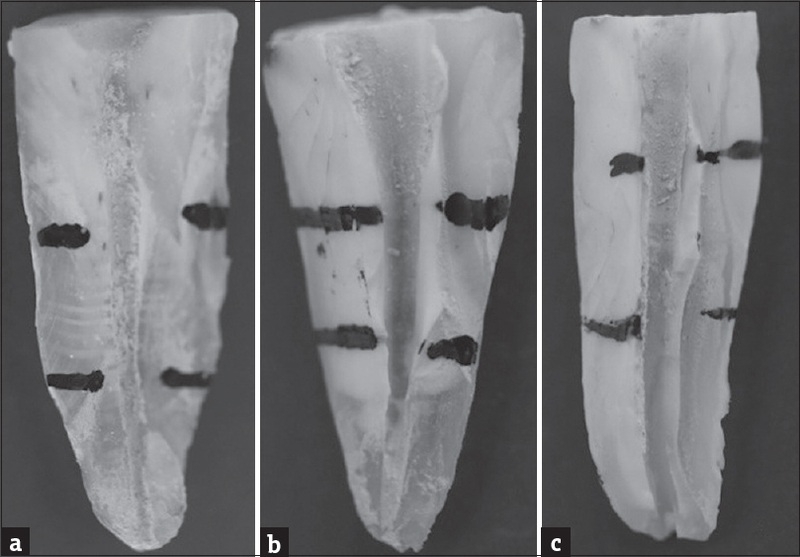 Materials and Methods: For this investigation, a human maxillary premolar tooth was selected. Master model preparation was performed with a demand bur under water spray. Master die was taken to fabricate 105 epoxy resin replicas. The crowns were milled using a CEREC 4 CAD/CAM system (Software Version, 4.2.0.57192). CAD/CAM crowns were made using resin nanoceramic, feldspathic glass ceramic, lithium disilicate, and leucite-reinforced ceramics. Each group was subdivided into three groups in accordance with three different cement thicknesses (30, 90, and 150 μm). Crowns milled out. Then RelyX™ U200 was used as a luting agent to bond the crowns to the prepared samples. After one hour cementations, the specimens were stored in water bath at 37°C for 1 week before testing. Seven unprepared and unrestored teeth were kept and tested as a control group. A universal test machine was used to assume the fracture resistance of all specimens. The compressive load (N) that caused fracture was recorded for each specimen. Fracture resistance data were statistically analyzed by one-way ANOVA and two-factor interaction modeling test (α = 0.001). Results: There are statistically significant differences between fracture resistances of CAD/CAM monolithic crown materials (P < 0.001). It is seen that cement thickness is not statistically significant for fracture resistance of CAD/CAM monolithic crowns (P > 0.001). Conclusions: CAD/CAM monolithic crown materials affected fracture resistance. Cement thickness (30, 90, and 150 μm) was not effective on fracture resistance of CAD/CAM monolithic crowns. Context: Through the process of socialization, women and men are conditioned to behave and play different roles in society. While the African culture “rewards” women who have vaginal birth despite the cost to their health, the burden of reproductive decision-making is placed on the menfolk. However, these seem to be changing. Aims: Our aim was to assess the beliefs and perceptions of pregnant women about cesarean section (CS), including their views regarding decision-making on the mode of delivery, in Enugu, Southeast Nigeria. Settings and Design: A cross-sectional descriptive study. Subjects and Methods: A structured questionnaire was administered to 200 pregnant women, following an oral informed consent. Statistical Analysis Used: Statistical Package for the Social Sciences version 17 with descriptive statistics of frequencies and percentages. Results: All the respondents believe that CS is done for the safety of the mother/baby. Thirteen percent reject the procedure for themselves no matter the circumstance. Joint decision-making was the view of two-thirds of the women. Majority of them will accept CS if their husbands consent. Younger women were of the view that husbands decide on the delivery mode (P = 0.019). Conclusions: Culture remains an impediment to CS uptake. Most women preferred joint decision-making on the mode of delivery. Aims: The aim of the present study was to comparatively analyze oral health status and influential factors in children with autism living in the Western Mediterranean Region of Turkey. Subjects and Methods: This cross-sectional study was conducted in two steps: 1 - questionnaire and 2 - interview. This study was conducted at the Department of Pediatric Dentistry, Faculty of Dentistry, Süleyman Demirel University, Isparta, Turkey, within the period from March to July 2016. Although the questionnaire part involved 126 children with autism and 111 children without autism, 63 children who did not satisfy the inclusion criteria were excluded from the study in the interview part. The forms were sent to previously determined schools, and factors such as age, socioeconomic status, medical history, dental history, eating habits, bad habits, and treatment methods preferred by children's parents were analyzed. Later, interviews with the children were carried out by the same researcher and their oral health conditions were recorded. Results: Children with autism often have nutritional problems, and early initiation of special education appears effective in preventing these conditions. Although children with autism apply for dental services, the rate for these children receiving dental services is considerably low and most of the services rendered are tooth extractions. Conclusion: It appears that the oral status of children with autism is affected negatively by many factors. Thus, the parents, the educators, and the dentists should be aware of this fact and encouraged to improve such children's oral hygiene and provide the dental care they need. Background: Breast cancer is the most common malignancy among females all over the world. The incidence of breast cancer is persistently on the rise due to urbanization and lifestyle changes. Although various risk factors have been suggested for estimating the risk of developing breast cancer, most of these have been studied in the Western population. A better understanding of local characteristics of risk factors may help in devising locally effective prevention strategies for breast cancer. The primary objective of the study was to study the risk factors for carcinoma breast among Indian women. Materials and Methods: This was a case–control study, conducted from January 2011 to December 2012, at a tertiary level teaching institution. A total of 100 patients of Indian origin, attending the General Surgery Department with carcinoma breast during this period were the cases. Controls were the blood relatives of patients with other diagnosed malignancies. Results: The major risk factors for breast cancer are found to be age, diet, waist size, hip size, waist-hip ratio (WHR), body mass index, high-density lipoprotein cholesterol, triglyceride, more than three pregnancies, number of years of menstruation, atypical hyperplasia in the previous biopsy, and history of carcinoma in relatives. Conclusions: Waist size and WHR are the major risk factors for carcinoma of breast. Adequate exercise and weight control are the most effective lifestyle changes that can reduce the risk of developing breast cancer. Context: Aging is characterized by progressive and generalized loss of skeletal muscle mass and strength called sarcopenia which causes poor health and disability. There is paucity of data on this syndrome of public health importance among older Nigerians. 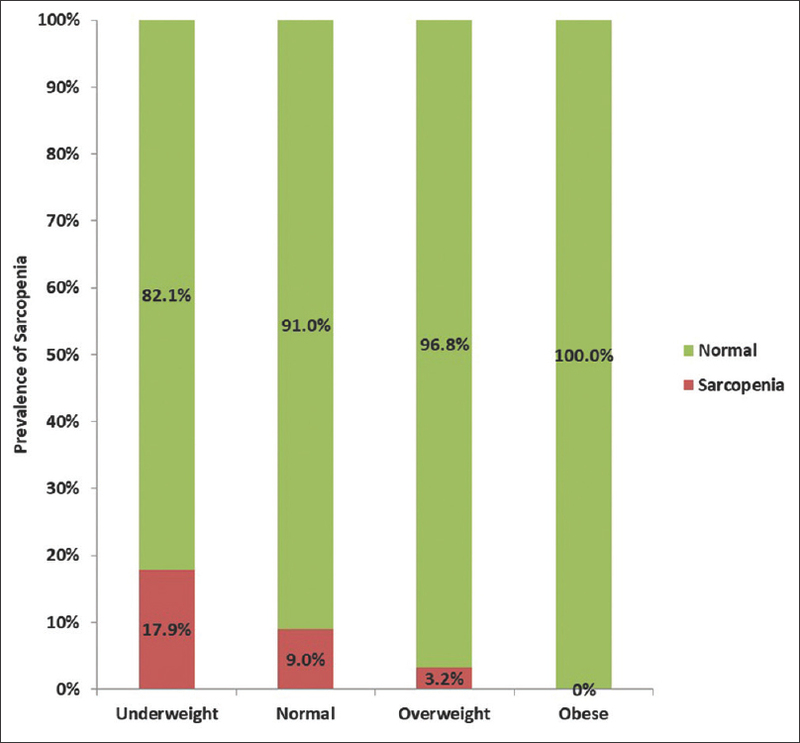 Aim: This study determined the prevalence and factors associated with sarcopenia among persons aged 60 years and above at a geriatric center in Nigeria. Materials and Methods: A cross-sectional study of 642 persons aged ≥60 years who attended the geriatric center between March and July 2014. Sarcopenia was diagnosed using the European Working Group on Sarcopenia in Older People criteria. Bivariate and multivariate analyses were carried out using SPSS 20. Alpha was set at 0.05. Results: The mean age ± standard deviation of the respondents was 69.1 ± 7.2 years, and 378 (60.6%) were females. The point prevalence of sarcopenia was 5.4% which was significantly higher among the females compared with the males (7.1% vs. 2.8%) P = 0.02. Low muscle mass and low gait speed were found in 10.9% and 36.1%, respectively. Logistic regression analysis showed age (odds ratio [OR] =1.090; 95% confidence interval [CI] =1.034–1.149, P = 0.01), having no formal education (OR = 2.810; 95% CI = 1.043–7.573, P = 0.04), malnutrition (OR = 5.817; 95% CI = 1.471–23.434, P = 0.01), and female gender (OR = 3.068; 95% CI = 1.068–8.817, P = 0.04) to be the predictors of sarcopenia. Conclusion: Older people in this setting are at risk of developing sarcopenia, especially the females. Healthcare workers should address the social and health-related factors which could lead to sarcopenia. Aim: This study aims to report the outcomes of new-generation hybrid contact lenses for visual rehabilitation of postkeratoplasty patients. Materials and Methods: Twenty eyes of twenty postkeratoplasty patients were fitted with hybrid lenses. Each patient's keratometric values, ocular surface irregularity indices, central corneal thickness (CCT), uncorrected visual acuity (UCVA), spectacle-corrected visual acuity, contact lens-corrected visual acuity, contact lens fitting data, and contact lens daily wearing time were recorded. Follow-up examinations were performed at 1st week, 1st month, and 3rd month visit after successful fitting of the lenses. Results: The mean age of the patients was 38.42 ± 4.89 years. The mean spherical component of refractive error was −4.46 ± 2.1 D, and the mean astigmatism was −5.31 ± 1.55 D. The median UCVA was 1.00 logarithm of the minimum angle of resolution (logMAR) which improved to 0.40 logMAR after spectacle correction. The median visual acuity with hybrid contact lenses was 0.05 logMAR. The median CCT was 544.4 μm and increased to 549.2 μm at 3 months after contact lens wear. The difference was not statistically significant (P = 0.38). The mean follow-up of patients was 4.32 ± 0.45 months. Eighteen of twenty patients reported a mean of 8.37 ± 1.95 h comfortable wearing time per day during this period. Two patients discontinued contact lens wearing due to conjunctival hyperemia. No graft-related complications such as decompensation, rejection, and infection were documented during the follow-up period. 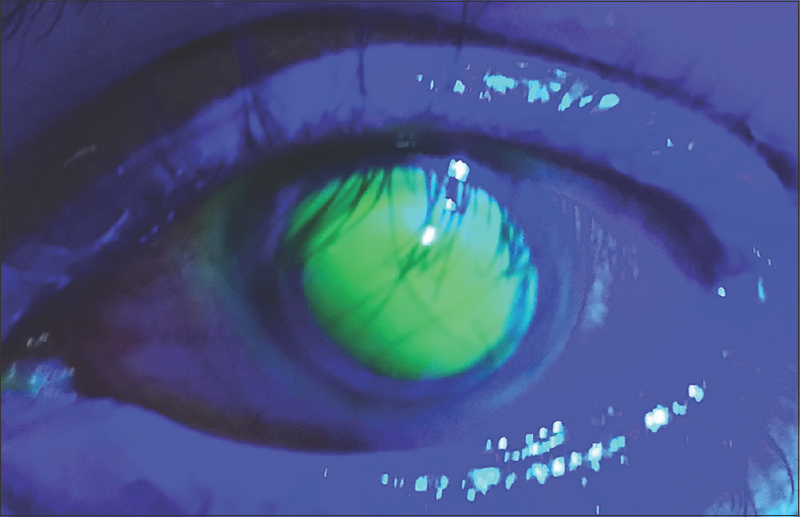 Conclusion: The new-generation hybrid contact lenses can be considered helpful in the visual management of postcorneal graft patients, particularly who are unable to achieve an adequate visual outcome with spectacles. 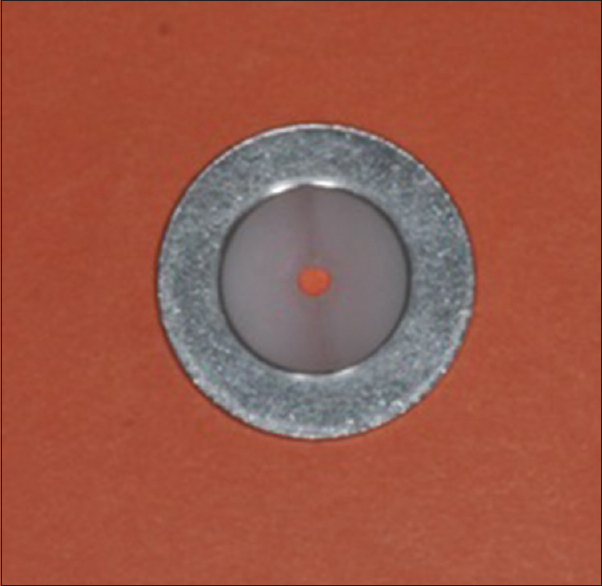 Aims and Objectives: The aim of the study was to analyze and quantify the pattern of corneal astigmatism in Caucasian cataract surgery patients using a new optical biometer (axial length [AL] Scan, NIDEK Co., Gamagori, Japan). Patients and Methods: The datasets of cataract surgery patients acquired between March 1, 2014, and April 15, 2016, were collected and analyzed. The corneal power (flat keratometry, steep keratometry, and mean keratometry), negative cylinder power, and axis of astigmatism were recorded. Keratometry values were optically measured by optical low coherence interferometry (AL-Scan, NIDEK Co., Ltd.,) before cataract extraction. Results: The study comprised 1233 eyes of 838 consecutive cataract candidates with a mean age of 66.8 ± 10.7 years (range 40–97 years). The mean keratometry value and corneal astigmatism were 43.69 ± 1.61 D and 0.84 ± 0.70 D, respectively. Corneal astigmatism of 1.00 D or greater was found in 344 eyes (27.9%), and 548 eyes (44.4%) had against-the-rule astigmatism. A trend toward decreasing J0 and J45 with age was found by linear regression models. The per-year increase in age was associated with a J0 and J45 decrease of 0.002 D and 0.001D, respectively. Conclusion: This study provides the distribution of astigmatism axis and power for cataract patients in age subsets from Turkey. Objectives: The aim of the present study was to investigate the root canal configurations of primary mandibular second molars (PMSMs) using Vertucci classification. Materials and Methods: The root canal types of 228 PMSMs (228 mesial and 228 distal roots) were evaluated. In addition, the relationship between external root morphology and Vertucci classification was investigated. The Chi-square test or Fisher Exact Chi-square test was used for the evaluations, and P < 0.05 was considered statistically significant for all tests. Results: The most commonly observed root canal type, which was observed in 228 roots (50%), was Type 4 followed by Type 8 (15.79%), Type 5 (14.47%), Type 1 (9.21%), and Type 3 (6.57%). In 150 mesial roots, the root canal Type 4 was observed whereas the same type was observed in 78 distal roots, and the difference was significant (P < 0.001). In flat roots (82.9%), the most frequently observed root canal type was Type 4 (50.8%) (P < 0.001). Conclusion: Various root canal types were observed in both mesial and distal roots although Type 4 was the most commonly observed. Root canal types showed a consistent relationship with separated and conical root shapes whereas the flat roots showed different root canal types. Background: Bleeding disorders (BDs) are characterized by abnormal bleeding for which effective management requires a combination of skill, workforce, diagnostic facilities, and adequate therapeutic options. Objectives: The objectives of this study were to determine the capacity of Nigerian hematologists to handle BDs and to assess availability of required infrastructure, equipment, and treatment options. Materials and Methods: This descriptive study was conducted during the 2016 scientific conference of the Nigerian Society for Hemetology and Blood Transfusion. A structured questionnaire was distributed to hematologists in attendance. Data were analyzed with SPSS version 21. Results: A total of 55 (76.4%) hematologists from 27 centers responded. The most frequently carried out tests to assess bleeding were hemoglobin or packed cell volume (100%), full blood count (96.3%), and prothrombin time/international normalized ratio and activated partial thromboplastin time (77%). Many centers did not have a coagulometer (47.8%) or cold centrifuge (43.4%) and none had thromboelastography or rotational thromboelastometry. Fresh whole blood was the most accessible (88.5%) and up to one-third of the centers did not have access to component therapy. Only 39.1% centers had factor concentrates available. Conclusion: Facilities required for diagnosing and treating BD are significantly deficient in most centers in Nigeria. Funding to provide facility and training is required to improve on this inadequacy. Purpose: The purpose of this study is to compare the success rates of inferior alveolar nerve block (IANB) and buccal infiltration anesthesia of mandibular second premolar with irreversible pulpitis and to evaluate the level of patient discomfort with these methods. Matherials and Methods: Forty patients, who had irreversible pulpitis in the mandibular 2nd premolar teeth, were included in the study. Patients were randomly distributed in two groups. In one group IANB, in the other group buccal infiltration anesthesia were performed. The efficacy of these two different anesthesia techniques on the related teeth was investigated with the Heft–Parker visual analog scale. In addition, with a pulse oximetry device, the changes in the patients' heart rates were compared between the groups. The obtained data were evaluated statistically. Results: Both anesthesia techniques reduced the pain significantly in patients before the administration (P < 0.05), but there was no significant difference among the groups regarding the pain control and success rates of anesthesia (P > 0.05). Both of the anesthesia techniques increased the heart rate (P < 0.05). The increase in the heart rate of the patients was significantly higher in the buccal infiltration anesthesia group than the other anesthesia group (P < 0.05). Conclusion: Within the limitation of this in vivo study, there was no difference between the efficacies of the buccal infiltration anesthesia and IANB anesthesia in the mandibular 2nd premolar teeth with irreversible pulpitis. Buccal infiltration anesthesia caused more discomfort in the patients compared with the IANB during the administration. Background: Diabetic retinopathy (DR) is the leading cause of preventable blindness in the productive population that poses a considerable global public health burden. Objective: The objective of this study is to assess the knowledge, attitude, and practice of DR screening among physicians in Northwestern Nigeria. Materials and Methods: Survey responses were obtained from 105 physicians in 4 tertiary hospitals using a Likert scale questionnaire. The internal consistency of the questionnaire was calculated using Cronbach's alpha coefficient. Principal component analysis was used for data reduction and grouping with the varimax rotation method, and the factors were extracted based on an Eigenvalue >1. Results: Most of the respondents (78.8%) were aware of the most effective method of delaying the onset of DR and frequency of eye examination (94.1%). Lack of ophthalmoscopes (70.6%) and dilating eye drops (50.6%) form important barriers to performing a good eye examination. 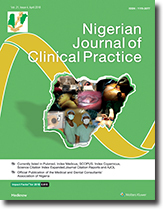 Conclusion: DR screening among physicians practicing in Northwestern Nigeria was suboptimal, which prompts the need for improved training of physicians managing persons with diabetes on eye examination in a bid to strengthen DR screening and reduce the burden of visual impairment in our environment. Aim: The aim of this study was to evaluate the factors that are effective for the treatment, recovery of pressure injury (PI) and costs in palliative care (PC) patients. Materials and Methods: From a retrospective review of patient records, the PI localization, the presence of infection, PI stage on admission, discharge and treatment costs were recorded. Patients were grouped according to diagnoses, and PI localizations (sacrum, trochanter, ischium, and heel). The comparison was made of changes in wound stage in the groups. Results: PI was present in all 154 patients during hospitalization and in 94 (61%) on discharge. Full recovery was determined in 52/129 (40.3%) patients with PI in the sacrum, in 23/46 (50%) in the trochanter, in 22/40 (55.0%) in the heel, and in 10/12 (83.3%) in the ischium. Worsening PI stage was observed in 5 (3.9%) in the sacrum, in 1 in the trochanter and in 4 in the heel. Improvement in PI stage was seen in 96 (74.4%) in the sacrum, in 35 (3.9%) in the trochanter, in 27 (50.5%) in the heel, and in 10 (83.3%) in the ischium. Regardless of wound localization, the improvement was observed in 168 (74%) of 227 PI and worsening in 10 (4.4%). The group with no change in the PI stage had prolonged hospital stay and higher costs. The Karnovsky Performance Score and Glasgow Coma Score of fully recovered patients were determined to be higher, and no statistically significant difference was seen in respect of age. Conclusions: PC patients are prone to PI due to many chronic diseases. The localization of PI and infection are effective factors in the healing of ulcers. The treatment costs for PC patients is higher if they have a pressure ulcer. More comprehensive studies will be useful to clarify the economic and social dimensions of this issue. Objective: The aim of this study is to describe the pattern of presentation osteoarthritic patients with sickle cell disorder (SCD) in our environment, determine the implant sizes taking the peculiar nature of the pathology and our operating environment into consideration, highlight the challenges and technical difficulties encountered during the procedure, measure the functional outcome and observe complications of treatment, recommend ways of improving outcome. 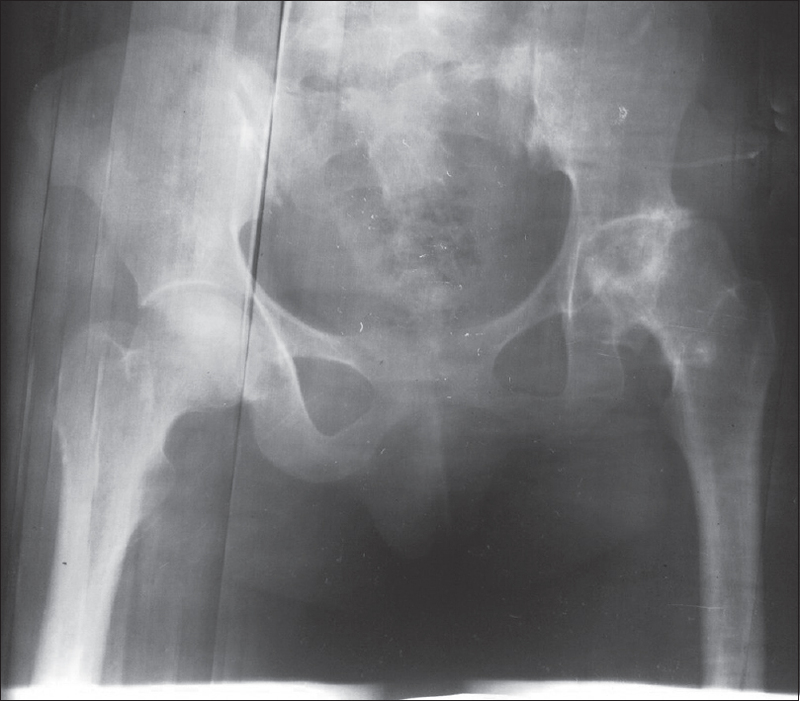 Patients and Methods: Between November 2008 and November 2012, 29 consecutive primary total hip replacements (THRs) were performed on 21 patients with avascular necrosis of the head of femur secondary to SCD. Patients' evaluation was performed at two different times of follow-up (1 and 5 years, respectively). Results: Twenty-one patients were available at 1 year as well as 5-year follow-up. The mean preoperative Harris Hip Score was 20.17 ± 11. The mean postoperative Harris Hip Score was 92.25 ± 13 (P < 0.001) at 1 year and 88.75 ± 10 (P < 0.001) at 5 years. Eighteen patients had regional anesthesia while three had general anesthesia. The average cup size used was 49.43 with a range of 46–54. The average liner size was 49.43 with a range of 46–54. The head size used in all patients was 28. The average stem size was 6.57 with a range of 6–8. The offset used in all the patients was standard All the patients had 1–2 screw fixation of the acetabular shell. Four patients had complications as follows: periprosthetic fracture 1, superficial wound infection 1, pulmonary complication 1, and abdominal crisis 1. Conclusion: THR is a veritable means of treatment of patients with avascular necrosis of the femoral head arising from SCDs. The challenges encountered during the surgery are related to the quality of bone of the affected patient. Arthroplasty Surgeons in our environment must be fully prepared for the challenges by ensuring a preoperative plan that will take care of the technical problems such as recreating femoral canals, wiring of intraoperative fractures as well as treatment of acetabular defects. A detailed planned total hip arthroplasty can be performed in patients with SCD in younger patients with good clinical benefits. Background: The aim of this study was to compare the retreatment time and the removal efficiency of different root canal sealers using WaveOne Gold reciproc file system by measuring required time. Materials and Methods: Forty-five mandibular premolars were prepared and randomly divided into three groups (n = 15). In Groups 1–3, the canals were filled with gutta-percha and mineral trioxide aggregate (MTA) Fillapex, EndoREZ, and AH26, respectively. After 7 days, root canal filling materials (RCFM) were removed with WaveOne Gold reciproc files by measuring time. Teeth were grooved and sectioned longitudinally, then remaining RCFM was evaluated using digital camera. The images were transferred to image analysis software to measure the areas of remaining RCFM. Data were analyzed using one-way analysis of variance and Tukey's test (α = 0.05). Results: There was a statistically significant difference between groups according to time required for removing RCFM (P < 0.05). The time required for removing RCFM was significantly shorter in Group 1 and longer in Group 3 than the other groups (P < 0.05). In Group 1, the remaining RCFM was more than other groups at middle third (P < 0.05), but there was no statistically significant difference between groups at coronal and apical thirds (P > 0.05). Conclusions: None of the sealers evaluated in this study could completely be removed from the root canals. MTA-based sealer was removed faster than resin-based sealers. Background: Glioblastoma multiforme (GBM) is the most common primary brain tumor characterized with poor prognosis and short survival. In addition to the standard treatment protocols, targeted molecular treatment options are under trial. In the recent trials, erythropoietin and erythropoietin receptor were found to be linked with the progression of GBM cells. Aim: In this study, we compared the expression of EPOR with survival in GBM patients with mortality. Materials and Methods: Twenty-six patients operated for GBM in 2012–2014 were enrolled in this study. 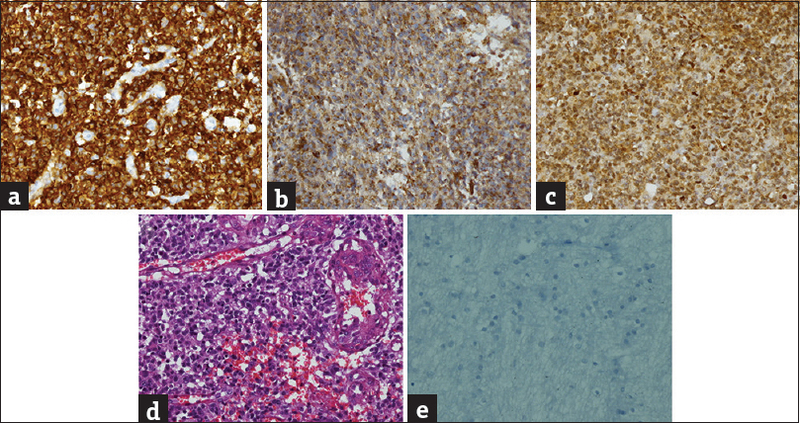 Tumor tissues were stained with EPOR, epidermal growth factor receptor, vascular endothelial growth factor, and assigned as (1+), (2+), and (3+) according to their immunohistochemical staining levels. The average postoperative follow-up time was 9.3 months. Kaplan–Meier's survival test and Spearman's correlation test were used in statistical analysis. Results: EPOR 1(+) stained group showed a median survival of 8 months (95% confidence interval [CI]: 0.954–15.046). EPOR 2(+) stained group showed a median survival of 6 months (95% CI: 2.901–9.090) EPOR 3(+) stained group showed a median survival of 2 months (95% CI: 0.400–3.600). (Kaplan–Meier P = 0.002). Conclusion: These results portrayed that EPOR staining levels were inversely proportional with average survival time. In the future, specific inhibitors of this molecule could be used to form a novel treatment option for GBM. Objectives: The purpose of this study was to compare the shear bond strength of a novel repair system, Nova Compo SF with Ceramic Repair, Ivoclar, to computer-aided design/computer-assisted manufacturing (CAD/CAM) restorative materials (IPS e.max CAD and Empress CAD). 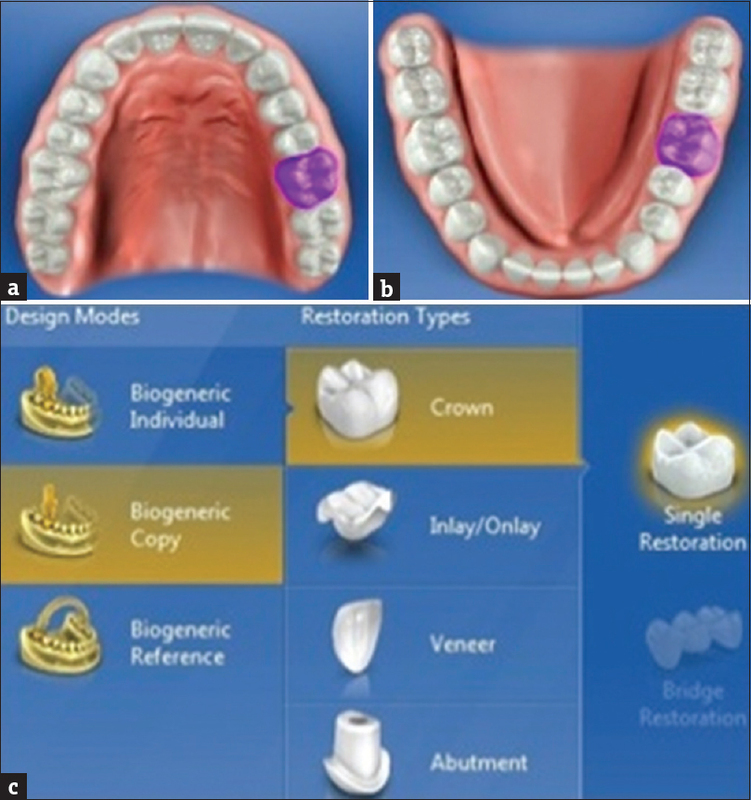 Materials and Methods: The specimens of each CAD/CAM restorative material were randomly divided into two subgroups of nine specimens, using one of two repair systems. All specimens were etched with hydrofluoric acid and rinsed under a water spray for 10 s, then air-dried for 10 s. Next, repair systems were applied according to the manufacturer's instructions. All specimens were stored in distilled water at 37°C for 24 h and then additionally aged for 5000 thermal cycles. A shear bond strength test was performed using a universal testing machine. Each fracture type was examined under a stereomicroscope at ×12.5 magnification. A two-way ANOVA test was used to detect significant differences between the CAD/CAM restorative materials and the composite repair systems. Subgroup analyses were performed using Tukey's honest significant difference. Results: No statistically significant differences were observed between the repair systems (P = 0.9). The bond strength values from Empress CAD were statistically higher than those from e.max CAD (P < 0.05). Conclusions: Within limitations, SuperFlow may be an alternative to the ceramic repair materials we routinely used in the clinic. Empress CAD can be preferable to e.max CAD in terms of esthetically suitable clinical indications. Background: Recent guidelines from the National Institute for Clinical Excellence recommend the use of ultrasonography in the central venous catheterization of children. 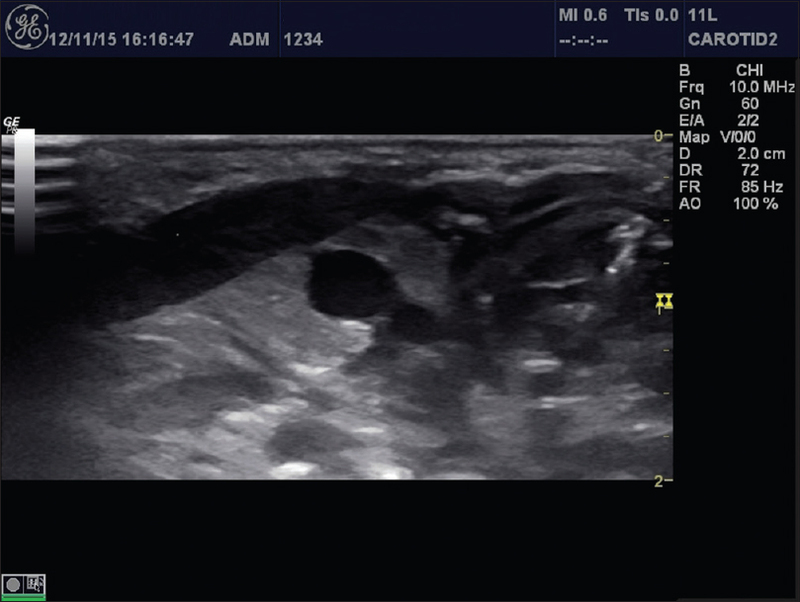 In this study, we aimed to compare area measurements using ultrasonography and efficiency of varying Trendelenburg degrees on the area measurements, for two different entry points used as internal jugular vein (IJV) cannulation points in newborns. Methods: Fifty-eight healthy newborns, weighing between 3000 and 3500 g, were recruited for this prospective study. Right IJV (RIJV) consecutive measurements were performed in three different Trendelenburg positions at 0°, 15°, and 30°, at two different entry points: The superior approach and an inferior approach. The landmark used in the superior approach was the top of the triangle formed by the two heads of the sternocleidomastoid muscle with the clavicle; while in the inferior approach, it was taken as the midpoint of the clavicle, as measured from the upper edge of the clavicle. Results: The cross-sectional area (CSA) of the RIJV was significantly increased when using the inferior approach, compared to that in the superior approach, in all Trendelenburg degrees, including the neutral position. Both 15° and 30° Trendelenburg positioning resulted in a significant increase in CSA, both in superior and inferior approaches, when compared to neutral positioning. Conclusion: The use of 15° Trendelenburg positioning may have significant advantage for increasing the CSA when used with the inferior approach. Aim: The aim of this randomized study was to compare the alveolar bone thickness (ABT) of the mandibular incisor teeth of dental and skeletal Class I, II, and III adult patients at labial and lingual aspects of the bone and develop recommendations for the associated movements of teeth in this region, taking vertical facial type into consideration. Material and Methods: Sixty-two Class I, 74 Class II, and 63 Class III patients - aged between 20 and 45 - were assigned to three subgroups – high (H), low (L), and normal (N) growth patterns. 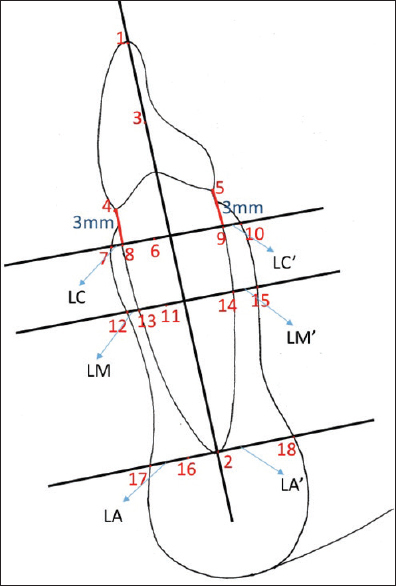 On the axial slices of computerized tomographies, the measurements for the ABT on labial and lingual sides of the mandibular incisors were carried out at three levels. Results: In Class I group, at apex region, ABT of subgroups N and L were greater than H, at labial side. In Class II, ABT of subgroups N and L were greater than H, at apex at both sides and cervical lingual region. Similarly, ABT of subgroup L of Class III group was greater than H, at labial and lingual apex, mid-root regions. In Class II, the ABT of subgroup H was greater than L, at lingual cementoenamel junction. Conclusions: ABT of mandibular incisors of Class I patients is not affected from vertical pattern except for apical region. There is not a thick bone on the lingual side of the Class II, high-angle patients. The ABT of the Class III, high-angle patients is thin as a risk factor for proclination. Purpose: To compare fracture resistance force (FRF) and failure types of crowns milled from resin nanoceramic (Lava Ultimate)-, and modified polymethylmethacrylate (PMMA) (Vita computer-aided design (CAD)-Temp)-, and PMMA (Telio CAD)-based CAD/computer-assisted manufactured (CAM) blocks. Materials and Methods: Three experimental groups of 10 milled crowns were arranged: Group-1 (Lava Ultimate), Group-2 (Vita CAD-Temp), and Group-3 (Telio CAD). Crowns were machined in sizes similar to a primary second molar stainless steel crown (SSC) and stored in water at 37°C for 30 days. The crowns were seated on Cr-Co dies. Their FRFs were measured using a universal test machine until fracture. FRFs and failure types were recorded and statistically analyzed (P < 0.05). Results: There were statistically significant differences among the groups for both FRFs and failure types. The sources of significant differences for FRFs and failure types were Group-3 and Group-1, respectively. Conclusion: Crowns milled from different chemical structural CAD/CAM blocks may be used for restoration of primary molar teeth. Hereditary angioedema is an autosomal-dominant disorder caused by mutation of the gene encoding the C1 esterase inhibitor (C1-INH). It manifests as painless, nonpruritic, nonpitting episodic swelling of the subcutaneous tissues, gastrointestinal, and upper respiratory tracts in the absence of urticaria. An attack typically takes 24 h to peak and resolves over 48–72 h. The most serious manifestation is a laryngeal attack associated with upper airway swelling. 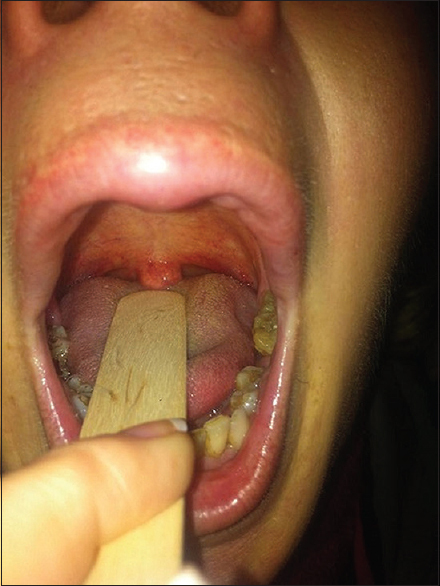 The aim of this case report is to describe the lifesaving use of a novel C1-INH protein concentrate in a patient with mild-to-moderate dyspnea caused by swelling of the upper airway (larynx) and tongue. We report two uncommon cases of acute urinary retention in Chinese patients caused by reactivation of sacral herpes zoster and requiring bladder drainage. Indwelling urinary catheterization, antiviral medication (ganciclovir), and physiotherapy with infrared light (830 nm) led to successful recovery of the micturition reflex in both cases.